A friend introduced me to these workbooks this past spring and I was immediately intrigued. It’s not often that you find full-colour, 130-page workbooks for about $12 each. 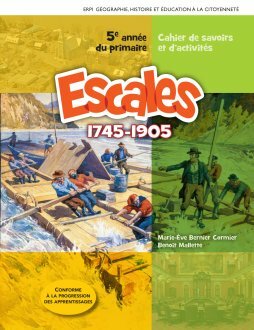 I bought two copies of the grade 5 level (years 1745-1905) and we started using them in the summer. This series is a great option for kids in grades 3-6 who are francophone or reasonably bilingual. Parents should also be able to read French fairly well in order to be able to use these books. It that’s you, I highly recommend this series. If not, try my resource filter to find something more suitable here. We spend part of our day together on the couch reading aloud and working through other activities. I just tacked this on to that time. I’ll read a section out loud and then each child completes the related questions on their own. When they are done, they hand it back to me and I look it over on the spot. We discuss their answers together. Since we’re only doing a page or two at a time, the process only takes about 10 minutes. I’m using these books as a review of topics that we’ve studied before. The books don’t go into enough detail for us to really connect with the people and events that they are describing BUT they do provide a great review or supplement. It’s a straight-forward book with short texts and questions that are to the point. It doesn’t take a long time to work through and yet my children are getting a good review of the history topics covered. They are also hearing and using different vocabulary than they use in our other French activities. The price point is also lower than other resources I’ve bought. I’ve often spent the same amount on PDF downloads that I still need to print myself, so getting this already done was a nice change of pace. The only expensive item is the correction manual (corrigé), which I didn’t buy and haven’t needed yet. Because I’m reading the text aloud to my children, I usually know the answers to the questions (they are in the text that I just read, after all!) or I can find them fairly easily. I’d be happy to google a few things if I needed to as well in order to save myself $80. Yikes. The grade 3 book covers the First Nations people. I didn’t purchase this book as we have studied this topic in detail already. Grade 4 covers the beginnings of New France. I wish I had discovered this series last year when we spent several months on this topic! You can read what we did here. Grade 5 covers from 1745-1905, so it picks up in New France just before the British conquest. It covers the transition to a British colony, life in the 1820’s, 1837-1838 rebellions, Confederation… all the way up to 1905. A full table of contents of each book and sample pages (labelled “extraits” in French) can be found here. I bought two copies of the grade 5 book from Renaud-Bray. I’ve bought one copy of the grade 6 book so far – I tacked it on to another order to get above $39 and get free shipping. It’s ready on my shelf for when we get there. I’ll buy another copy next time I need to get above $39 or when we’re ready for the book, whichever comes first! I purchased my copies of this resource on my own and have not received any compensation for telling you about this product. All opinions are my own and have not been endorsed by the publisher. This entry was posted in 11+ years, 7-10 years, Advanced, Bilingual parent, Curriculum, Immersion by Leanne. Bookmark the permalink. hello! I find your website very interesting. I have two kids I am tutoring in the US. They come to me from a French immersion school in Canada but without curriculum. They are in second grade. Any help you could provide me about work books, activities, material, curriculum would BE AMAZING! I need help trying to keep these kids up to pace with their home school while they are with me for the winter.